"A storm on the lake", piano music composed by Wm. Horatio Clarke with an engraving of the yacht ORIOLE on its cover. 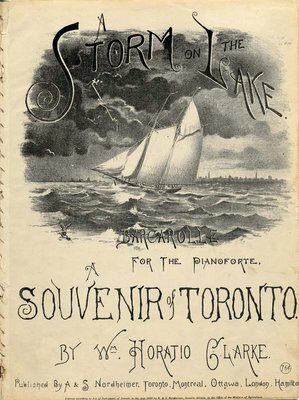 "A Storm on the Lake: Barcarolle for the Pianoforte, A Souvenir of Toronto by Wm. Horatio Clarke. Published by A. & S. Nordheimer Toronto, Montreal, Ottawa, London, Hamilton"